Attach a Google document, spreadsheet or presentation to your event or upload a file from your computer. Important: guests do not automatically have permission to view Google Docs attachments. You must share each attached document. 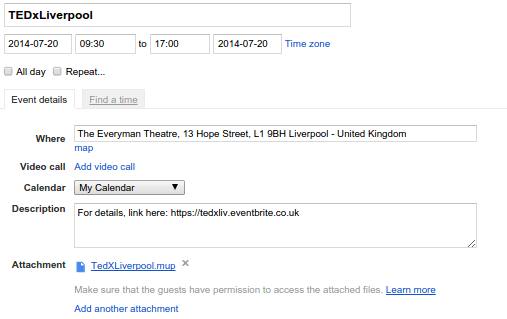 As Mindmup already stores the mindmaps on Google Drive, it should be easy enough to link them to calendar events. Therefore making it easy to find them and easily retrievable. I’m not sure if this is the case if its somebody elses calendar request but theres only one way to find out. Well it certainly saves me building some custom solution with my own version control system (had thought about running a XMLDB or NoSQL db locally and creating Xlinks to the mindmaps. And this could be done because Mindmup is open, has a API and is using standard technologies. @cubicgarden Loving http://t.co/V9RNqDxvHu. It is so ridiculously slick. Thanks for the tip. Doesn’t quite solve my Evernote connection issue, plus its really a binary blob rather than a nice mindmap but alas its the best I can think. I was going to give Google Keep a try for storing notes, so maybe that might do something better with it. Previous Previous post: Calendar Zero?